Yangju responds with disingenuous untruths. Home / Blog / Yangju responds with disingenuous untruths. We had received the response below, dated December 20, 2016 from the city of Yangju regarding our campaign urging their Sister City, Henrico County, Virginia to speak out against Yangju’s illegal and horrendous dog meat trade. 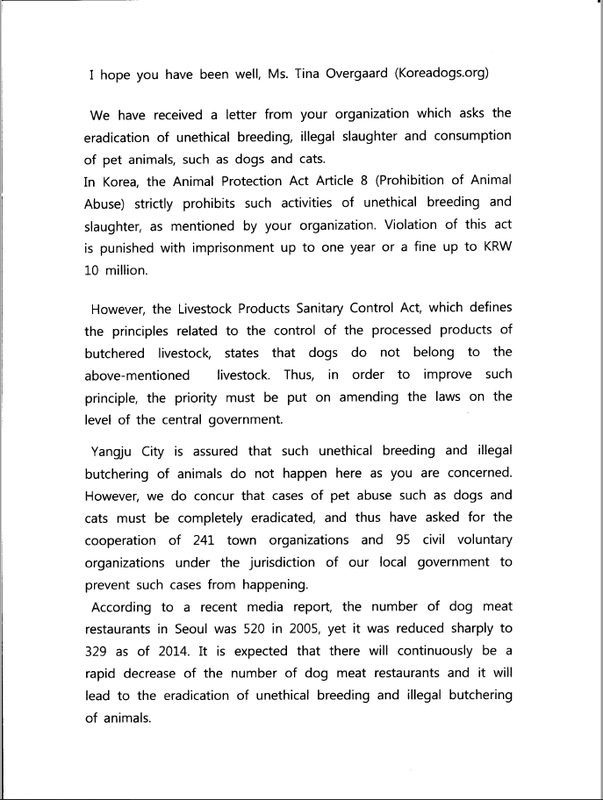 The letter states that “Yangju city is assured that such unethical breeding and illegal butchering of animals do not happen here as you are concerned”. It seems that the Yangu government is completely unaware that we have access to the internet and their most popular search engine which provides up-to-date information regarding their city’s dog meat restaurants and business establishments which commonly sells dog/cat products. Search engine results show 107 dog meat restaurants and countless more “health food” shops in and around Yangju. Their explanation of why the dog meat trade cannot be stopped is disingenuous, as their existing laws banning the dog meat trade is being ignored. 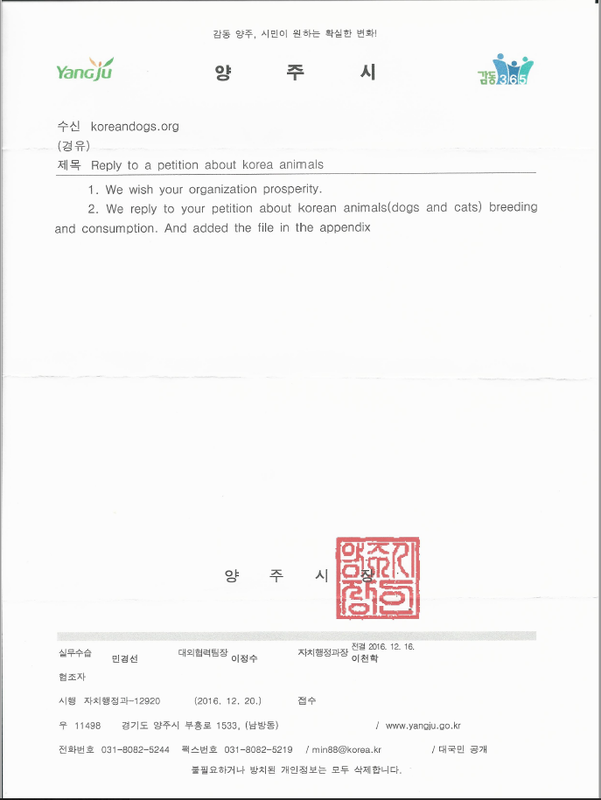 Their letter also stated that the number of dog meat restaurants in Seoul had declined to 329 as of 2014. Are we supposed to jump for joy? They seem to be completely out of touch with what we consider barbaric and hideous in a civilized and progressive society. They are now aware that they have our unbridled attention, and that their Sister City is being urged to take action. Therefore, we will say that our campaign was a success even though we are not sure what action, if there would be one, the city of Yangju will take to make any kind of change. Thank you to all of you who had taken action. Please continue to be the voice for the Korean animals. A disgusting disregard not only for the law but for the lives of these poor souls, this is not tradition…if it is…what does it say about the country! Send a reply with photos and links to videos. Show them the comments we are leaving.